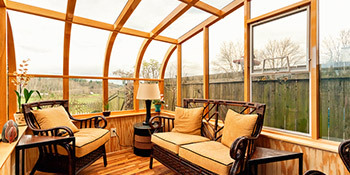 Conservatories add space to homes for minimal cost. What’s more, they’ll add value to your home, ensuring that you make a profit on the sale of your property in the future. Conservatory installations have become ever the more popular over the last few years, largely due to the poor state of the housing market. With the cost of moving exceeding £10,000 it’s often seen as more worthwhile to stay put and improve. With many designs and styles to choose from, including Victorian, lean-to and bespoke, there’s something for everyone. You can set your home apart from the crowd with a unique style and keep in touch with your property’s existing look. With a conservatory, you can enjoy the installation all year round with dining rooms and living areas popular. With great energy efficiency you can be sure to keep warm in the winter too. It’s not uncommon to find conservatoires installed at the back of properties, offering extra space that can be enjoyed throughout the year. The aesthetic appeal of wood is the chief reason many homeowners will opt to have this material for the framework. Wooden conservatories look brilliant and offer a different dimension to the option of aluminium or hardwood. They’re a great choice for traditional homes, which often allows planning permission for listed buildings and properties in Conservation Areas. Project: Supply only of hardwood, gable ended conservatory. Project: small wooden conservatory. 4m X 2m. The below data indicates the energy performance of properties in Uk. Energy ratings vary from A to G, with A being the most energy efficient and G being the least efficient. The Energy Performance Certificate (EPC) rating factors heavily when trying to sell your household, as prospective buyers will see how much they're likely to be spending on their home heating expenses. Property improvements such as insulation help to substantially increase a home's EPC rating. There are many different types of home in the UK and the info beneath highlights the type of homes in Uk. Over the country the most popular property types tend to be semi-detached and terraced housing, but detached homes, flats and bungalows are also available. The information underneath gives an indication for the number of properties in Uk that are central heated and non-central heated. Properties are heated by a number of sources which reflect how pricy annual energy bills are going to be. Examples of central heating include gas, electricity, oil, solid fuel and LPG boilers. Changing the way in which your house is heated can see you with cheaper bills. The data underneath shows the spread of houses heated up by various fuels. Around the UK the most common undoubtedly are gas heated properties, followed by electricity and then oil. Biomass boilers are also increasing in popularity, heated by environment friendly products such as wooden pellets or agricultural waste.|Houses in the UK are heated up by a number of fuels, such as gas, electricity, oil, solid fuel and LPG boilers. Each fuel has a varying cost associated with it which means you can find yourself with less costly energy bills by switching the way your home is heated. Even solar thermal panels are being considered by many people in order to cut heating bills for the many years to come.